Originally posted February 20 2008 at 20:02 under General and Physics. 0 Comments. Trackbacks Disabled. These dragons, they keep eating things. Or something. 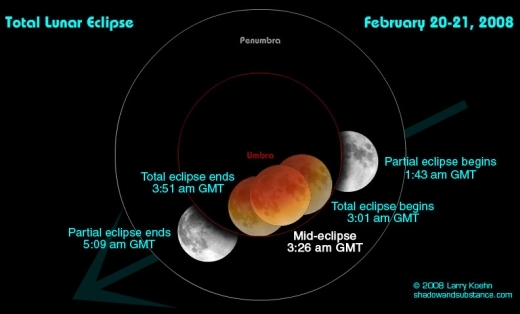 I’ve caught a cold, so probably won’t be up watching myself, but it’s the last chance to 2010 or something to see a total lunar eclipse, so worth mentioning. Totality begins 03:01 GMT on the 21st and end 03:51. The Moon will likely turn to blood (thanks to light refracted by the Earth’s atmosphere). That’s all if there isn’t too much cloud to see it which, let’s face it, there probably will be.